When I first started hearing this locution “Cap and Invest,” I thought it was a marketing ploy for cap and trade. Perhaps progressives found the word “invest” more focus-group appealing than “trade.” I catch conservatives doing the same thing, substituting the word “trade” with “tax.” This sound-bite language confuses different approaches to a carbon policy. A carbon tax is actually relatively better than cap and trade. If the emission of carbon is indeed a negative externality that two parties to a commercial transaction impose on third parties, then the free market economist Arthur Pigou figured out that the most economically efficient means of dealing with that pollution is not the command-and-control regulation approach, where the government simply bans it. Rather, the two parties in the exchange of a polluting transaction ought to be required to indemnify society by paying a tax equal to the value of their harm. If the transaction is still commercially viable after paying the tax, it’s better for society to emit the pollutant than to make it illegal. For people who think the social cost of carbon is $0, a carbon tax still makes sense for two reasons. First, it’s a total solution, meaning it can then replace all forms of climate regulations and subsidies. Second, mainstream science has revealed the social cost of carbon is actually a lot lower than environmental extremists imagine it to be. At about $40 or less per metric ton, a Pigovian tax would be less expensive than the ad hoc costs we are already enduring to reduce carbon emission in the Beaver State. Environmentalists tend not to like a carbon tax for that very reason. When CO2 is taxed this way, paying the actual social cost of carbon will probably have little impact on reducing our consumption of natural gas, gasoline, and diesel. What that means is, even if we were to accept the EPA’s estimate of the social cost of carbon, the social cost of not emitting carbon is higher. That’s why climate zealots who stand outside the boundaries of mainstream science prefer cap and trade where the level of carbon is capped regardless of the cost. But this pending Oregon legislation is actually worse than cap and trade. 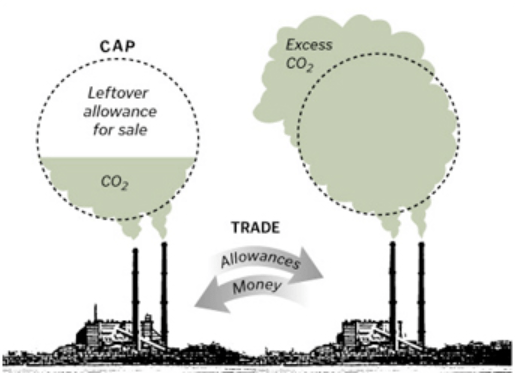 It really can be called “cap and tax,” because it does not create a real carbon trading market. Like the image above, in a true cap and trade design, every company is given an allocation of carbon it’s allowed to emit. Companies that are more carbon efficient and thus don’t use all of their allocation can sell it to companies that need to emit more than their allocation. Apparently, even cap and trade was too market-orientated for Oregon Democrats. Rather than have an open trade of carbon allocation, Senator Michael Dembrow and Representative Ken Helm envision a rigged government auction doing the selling, raising money to “invest” in centrally planned carbon mitigation projects, the same wasteful nonsense carbon taxes and cap and trade were designed to eliminate. That’s some serious bait-and-switch. Dembrow and Helm like to use the language of implementing a “market-based mechanism,” but apparently, they don’t realize that the whole point of cap and trade is to incentivize the private sector to do the investing, not siphon money from the private sector so the government can do the investing. We get the world of arbitrary command-and-control regulation by dictating the amount of carbon that can be emitted, completely disregarding the true social cost of carbon, and we get the wasteful world of government slush funds for financing the very boondoggle projects cap and trade was meant to replace. Vote Worst Politician: Kitzhaber, Cogen, Crew?